So you like the plays of Anton Chekhov? But were you wondering what the aristocratic Russian characters in The Seagull were really feeling? I mean, not just what they tell you they’re feeling, but what they would express if they were in an American musical? Whose songwriting skills would be up to that task? Perhaps the classy author of such standards as “Night and Day”, “It’s De-Lovely”, “Ev’ry time We Say Goodbye”, “Begin the Beguine” [and so much more]: Cole Porter. 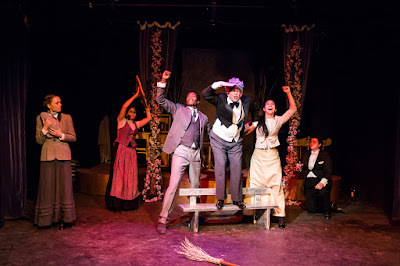 Medicine Show Theatre Presents Mr. Chekhov and Mr. Porter, conceived by Regan Vann Batuello and developed by The Roly Polys (Janet Bentley and Andy Evan Cohen). Director Janet Bentley and Musical Director Andy Evan Cohen have combed through Cole Porter’s lengthy catalog to find many evocative songs for a cast of twelve. My understanding is that mostly the older Cole Porter tunes were available for this show, but I also learned that “It’s De-Lovely”, which I know from the musical Anything Goes, is from an older show and was therefore available to grace this stage. Thanks to Porter’s thoughtful writings on people getting together and carousing, we have a full two-act, two-hour melodic string of pearls to enjoy. Hats off to Medicine Show, which has a history of supporting shows about Cole Porter. I don’t want to spoil the plots of any Chekhov plays. The Roly Polys’ program gives thoughtful synopses of the four major plays celebrated in this song and dance for the people jubilee. I hope I won’t be giving away too much by telling you that, in The Three Sisters there are several ladies who talk a lot about going to Moscow. It makes complete sense that Masha (Ivette Dumeng), Olga (Shea Madison) and Irina (Michelle Tsai) are up all night (they sing “In The Still of the Night”) and see a floating vision of that city’s landmark St. Basil’s Cathedral. When thinking about her unpalatable marriage prospects, Masha drinks, and sings “Make It Another Old Fashioned, Please”. Nina (Shea Madison) is the starlet whose graceful turns in The Seagull have two men diving for her like seagulls at an aquarium. She gets to join in a duet of the free-spirited nugget “Just One Of Those Things” with the writer Boris Alexayevich Trigorin (Daniel Robert Burns). Meanwhile, our sympathies may be with Konstantin Gavrilovich Treplev (Sam Durant Hunter). Nina sings “What Is This Thing Called Love” but Konstantin Gavrilovich Treplev’s love overtures to Nina earn him her singing of “Don’t Look At Me That Way”. Boris Alexayevich Trigorin may be the successful playwright; at least he informs us of his establishment success in the song “I Wrote A Play”. Konstantin Gavrilovch Treplev, however, is one of those one-woman men, and so logically (for him) progresses to the song “After You, Who?” Other bad things happen to Konstantin Gavrilovich Treplev. If you want to feel better about yourself, read the Chekhov play. Janet Bentley gets the credit for designing sets worthy of all four of Chekhov’s greatest hits. While Act One had a spare set evocative of a theater (see: Seagull), Act Two shows us the gilded homestead of Madame Lyubov Andreievna Ranevskaya (Cynthia Shaw) and surrounding suggestions of whispering cherry trees. Ranevskaya cannot afford to keep her estate, but can’t bring herself to countenance any of her options. We also get a nice dose of the play Uncle Vanya, for which the Vanya in question (Aran Beiderson), an undiagnosed bi-polar type, belts out the classic “Night and Day”. This was one of the must-have Porter songs which I must admit I didn’t understand how it fit into the revue until I went back to the text of Chekhov, who, after all, practiced medicine and was perfect as a playwright. Still, “Night and Day” was show-stopper. The turbulent chemical reactions spasming between Vanya and Yelena (Shea Madison) find words in the song “You Irritate Me So”. Since life is like a bowl of cherries and we all want to see some dancing, it is great to see Ranevskaya and her brother Gaev (Daniel Robert Burns) sing “Well, Did You Evah?”. This song appeared in the 1956 film High Society, although, I have now learned, it was also written for a different 1939 production. With the original lyrics, Mimsie Starr did not get pinched in the Astor bar; however, the family’s Cherry Orchard is still not safe. Indeed, The Cherry Orchard has beginnings and endings. Trofimov (Demetrius Blocker), that “eternal student”, looks like he wants to do a dissertation on Anya (Michelle Tsai), with whom he sings “Down With Everybody But Us”. Anya directs “I Concentrate on You” to her beau. Charlotta (Justyna Kostek) wants us to know the joys of life when she regales us with “I’ve Still Got My Health” (something that the injured Cole Porter unfortunately did not enjoy). Since Russia had not too long before liberated its serfs, the play offers a triumphant moment for Yermolai Alexayevich Lopakhin (Bill Blechingberg). He has gone from working for this family to purchasing their cherry orchard. As he leisurely croons ”Begin the Beguine”, he prepares to chop-chop every tree in sight. As Madame Lyubov Andreievna Ranevskaya and her coterie depart from the Cherry Orchard, she and the cast sing “Ev’ry Time We Say Goodbye”. There is a lot to enjoy in this production. I know that the house I saw the show with was a die-hard Porter-house, who broke out into applause after the first few bars of any given song. Given the quality of the material, maybe a four-act, two-evening repertory production would also do justice to the most famous works of the doctor and the Porter. Madeline Jaye’s choreography shows us a people just steps away from the Revolution stepping to the beat. Janet Mervin’s elegant costumes include wigcraft (transforming Félix E. Gardón into the elderly servant Firs) and really bring out the beauty of these characters while giving them the flexibility to bust out in a chorus line or two. Janet Bentley has spent a lot of quality directing hours transforming this ensemble into so many characters in so many musical universes. I must congratulate everyone for coming together to bring the world this new fusion show with all of its artistry.